Use your iPhone to control your Lectrosonics SM family transmitters. 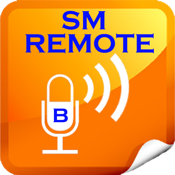 By utilizing the coded tone in the transmitter, SM Remote can control basic functions, gain functions, and frequency functions all from up to a foot away from the lav mic. A must have tool for any professional audio mixer and camera operator.